On 8 May 1962, McNamara Convened His Fifth SECDEF Conference in Saigon. The first two items on the agenda were reviews of Viet Cong and government military activities, separately, but back-to-back, like individual recapitulations of the scoring by two teams that had just played a football game. However, the time periods covered for each team was odd in the extreme. The briefing on South Vietnamese Army (ARVN) operations covered the fifty days prior to the conference. The briefing on Viet Cong operations covered only the twenty-six days prior to the conference—half of the time allotted to ARVN operations. The government review began with the date of March 21, but the Viet Cong review began with the date April 14. This was a scam. It was analogous to a sports announcer reporting the score of a football game who announced the points scored during the entire game for one team, and only announcing the points scored during the second half for the other team. Something else about these briefings was odd: McNamara was only told about the major communist attacks, whereas he was told about major and minor government attacks. This was analogous to reporting only the touchdowns for one team, while reporting both the touchdowns and field goals for the other team. When talking about Viet Cong operations, the briefer told McNamara that, since April 14, there had been no operations of battalion size (300 – 500 men), the largest involving about 50 men. The briefer gave no figures at all for how many of these fifty-men operations had occurred. When talking about ARVN operations, the briefer said that, since March 21, there had been over 40 operations of battalion size along with 400 minor offensive efforts. In our football analogy, this would make it look like one team virtually shut out its opponent. The problem is that the Viet Cong score for the first half of the game, as well as their field goals for the entire game, had been wiped off of the scoreboard. Why did MACV drop the Viet Cong score for the first half? Because they had scored touchdown after touchdown during the first half of the game. The Viet Cong carried out seven known, and possibly as many as ten, battalion-level attacks between March 29 and April 9. (See map insert on the previous page.) Moreover, they had conducted seventeen large-scale attacks involving 100 or more troops between March 15 and April 15. True, these attacks were by companies, not battalions, but they were not platoons (thirty men) either. Why did MACV drop the Viet Cong field goals for the entire game? Because those points added up to a very large score. The Viet Cong conducted over 200 minor offensive efforts between March 21 and the SECDEF conference, and over 3,000 armed incidents during the same period. These Viet Cong statistics are from the same time period that MACV reported the statistics for government operations. When all of the points for both teams are tallied for the entire game—21 March to 6 April—the score looks closer to a draw. Even this would depend on whether the figures supplied by the South Vietnamese about their own operations were from genuine operations or merely walks in the sun. In fact, most of them had been fictitious operations. The Viet Cong attacks had been coming in waves all year long, punctuated by periods during which they regrouped to replace their dead and refit their battalions and companies with new weapons. MACV deliberately chose to only report Viet Cong statistics from the lulls in their activity that occurred in between their offensives. 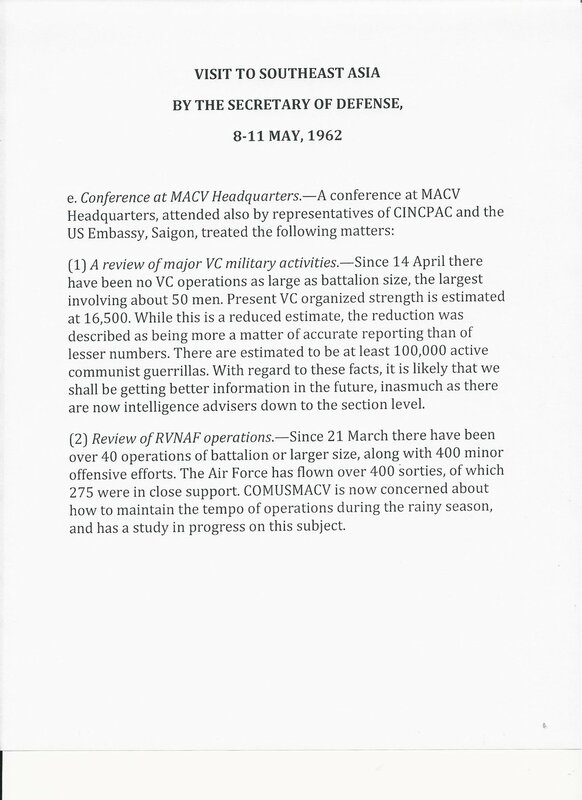 At the same time, MACV presented the secretary with ARVN activities during a period nearly twice as long. What made this sordid sleight of hand all the more reprehensible was the fact that the excised communist data also happened to be the largest and most concentrated Viet Cong offensive of the war up to that point. A true comparison of large and small-scale Viet Cong and ARVN operations for the same time period would have been truly alarming to the Secretary of Defense. The level and extent of Viet Cong operations was a truly amazing achievement for a force as small—and supposedly beleaguered by ARVN attacks—as MACV reported that it was. McNamara finally got his answer from Harkins on the size of the enemy. In the briefing, the figure was rounded off to 16,500 men.